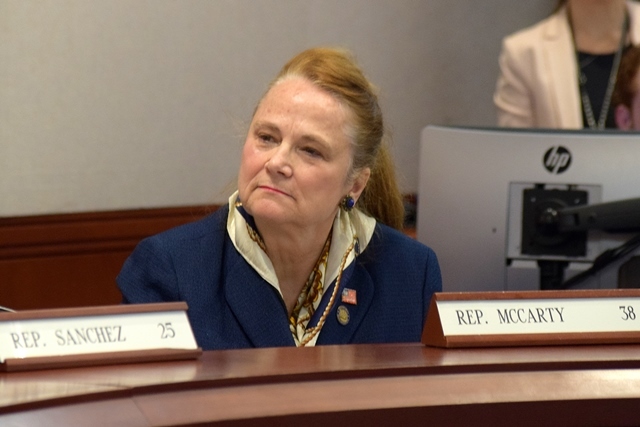 HARTFORD —State Representative Kathleen McCarty (R-38), member of the legislative Public Health Committee, has submitted numerous bill proposals this year that protect seniors and enhance mental health care services. Rep. McCarty’s bill proposals that benefit elderly persons and their loved ones include: requiring closing the gaps in background checks of hired homecare workers, expanding access to home care, providing transportation to non-ambulatory nursing home residents to visit family members’ homes, enabling nursing homes to install video cameras in the rooms of nonverbal residents (by request of the resident or family member, and at expense of the resident), increasing volunteer advocates for long-term care residents in nursing homes. Eliminating the negative stigma surrounding mental health challenges, and increasing patients’ access to the care they need, has been a priority of Rep. McCarty’s since she took office. To continue striving towards this goal, she has introduced legislation this year that would expand mental health care parity; which is the equal treatment of mental health conditions/substance use disorders and other chronic conditions, like diabetes, in insurance plans; evaluate programs funded by the Department of Mental Health and Addiction Services (DMHAS), require physicians to check the electronic prescription drug monitoring program before writing prescriptions, study Regional Behavioral Health Action Organizations, support community outreach programs that support peer to peer programs for individuals with substance and opioid use disorders, ensure seamless transitions for children between behavioral health providers, and study employment programs for individuals with intellectual disabilities. “It is so important that my constituents know that their mental and emotional health is just as vital to their well-being as their physical health,” said Rep. McCarty. “I am privileged to advocate for, support and align mental health services between state agencies and with mental health care providers. All bill proposals in the General Assembly are considered by legislative committees, and potentially brought to a public hearing, before being raised to the House and Senate for a vote. To read more about these bills, and find their bill numbers, please visit Rep. McCarty’s website at www.repmccarty.com and click on the “Legislation” tab. If you are interested in sharing your opinion on a bill, information on how to testify at a hearing or via email is available at www.cga.ct.gov.